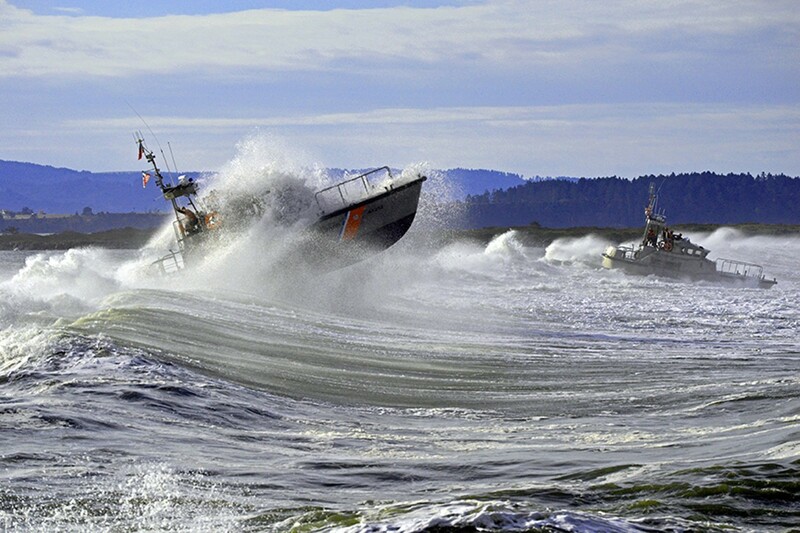 Coasties crossing the bar in January. 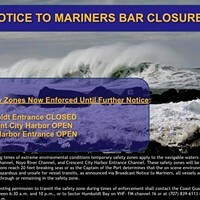 The entrance to Humboldt Bay has become dangerous for fishing boats and impassable for larger ships, thanks to winter conditions that created massive shoals off the jetties. Two or three cargo ships have already been turned away, said Harbor District CEO Jack Crider, and another chip ship is due April 20. It’s unclear if that ship will be able to land, given the current conditions and no remedy coming until mid-May. The shoaling is ongoing, Crider said, and has gotten worse even since winter officially ended. Chevron is running its own soundings, he said, and may determine that it needs to lighten its load on fuel barges that come into the bay two to three times a month. Relief will come in the form of Army Corps of Engineers dredging slated to start around the 15th of next month. The $7 million project should take about a month, Crider said, maybe longer, depending on weather. The Harbor District's own dredge is designed to dredge around marinas and small channels and isn't suitable to work on the bay entrance, he said, and the responsibility of the main channel falls to the Corps (which also holds the permit to do the work). Sediment has settled inside the bay, Crider said, making some of the navigable channels 4 to 5 feet shallower than he’d like for larger cargo ships. But the more serious problem is off the tips of the jetties, where the ocean is typically 39 to 40 feet deep. Sediment gathered there has reduced the depth to 14 to 15 feet, making it dangerous for deep draft ships to try and cross the bay entrance. This year’s extreme shoaling happened because of a combination of circumstances. Most of the sediment that settled at the tips of the jetties came out of the Eel River, Crider said. Years of drought and mild winters created a backup of sediment that blew out this season, and a combination of ocean currents and tides pushed it up against the jetty. That shoaling also creates a nasty wave break, making it dangerous for smaller boats to get in and out of harbor, even if they don’t risk running aground. With hints that the long-delayed crab season might open up in the next month, Crider is primarily concerned with the safety of crossing the entrance, which for decades was notoriously deadly. He’d like it to stay that way. Freelancer Ted Pease contributed to this report.